Two men are in hospital after a student demonstration against proposed tuition fee hikes turned violent in a matter of minutes in Victoriaville, Que. One man has lost the use of one of his eyes and sustained head injuries after a student demonstration against proposed tuition fee hikes turned violent in a matter of minutes in Victoriaville, Que. Friday night. The man, who will require surgery, is one of two men in their twenties being treated in hospital Saturday. The other man is being treated for head injuries but is in stable condition. Quebec provincial police arrested 106 people after the student demonstration. They may be charged with illegal assembly and participating in a riot, police said. 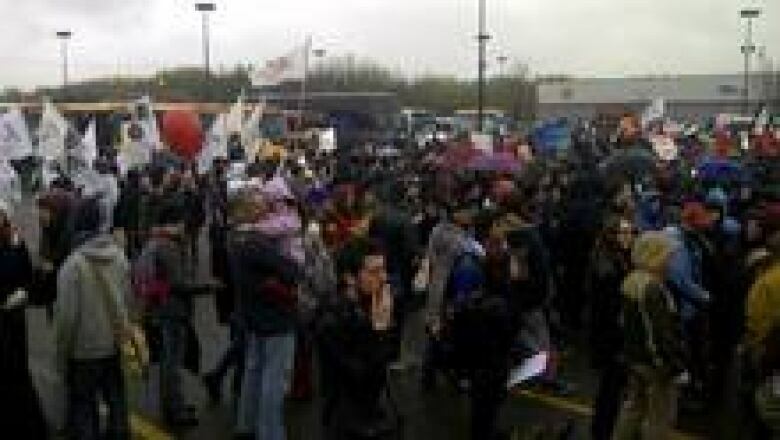 Several hundred students demonstrated outside the provincial Liberal Party's general council meeting in Victoriaville, a small town about 150 kilometres northeast of Montreal, a gathering attended by Premier Jean Charest. At least four police officers and seven demonstrators were injured. Some of the injured were taken to hospital. Police said at least one person suffered life-threatening injuries. One demonstrator was reportedly shot in the face with a rubber bullet. Protesters threw cans, rocks, billiard balls and bricks at police. They also smashed windows in the building where the meeting took place. Police hurled tear gas, used sound grenades and shot rubber bullets at protesters. They say they have arrested four people. The Liberals gathered for a weekend policy meeting, which could be the launching pad for a spring election. Barricades and police lines were set up to keep student protesters out. Delegates were forced to go through a series of security checkpoints as they enter the conference centre. The party moved its general council meeting from Montreal to Victoriaville, after student groups vowed to hold demonstrations outside the Montreal venue. The biggest issue looming over party delegates, and Charest's government, is the ongoing student conflict. But the official agenda of the meeting is to lay out some new Liberal policies, including the management of natural resources, and to discuss ways to breathe new life into Quebec's slumping manufacturing sector.